System builders look for software that is both easy to use and powerful; a software that can handle both simple tasks quickly while having the “depth” to be used for more complex scenarios. Usually this becomes a trade­off between “simple to use” and “very powerful” for which a solution is not easily found. "SmartMotor" Technology from IntelLiDrives offers a powerful, yet easy to use environment with a solid GUI as part of their intelligent motor control technology. A VB-­like language can be used for writing code directly or graphically. We will show here in an iterative process how the IntelLiDrives programming environment can be used efficiently to build a 2 axes, X­Y stage application incorporating: I/O, an analog joystick, user variables, conditional looping and multi­threading. 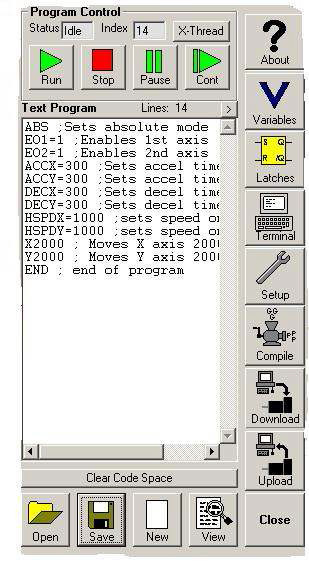 Let's begin by viewing the “SmartMotor” programming and GUI environment. 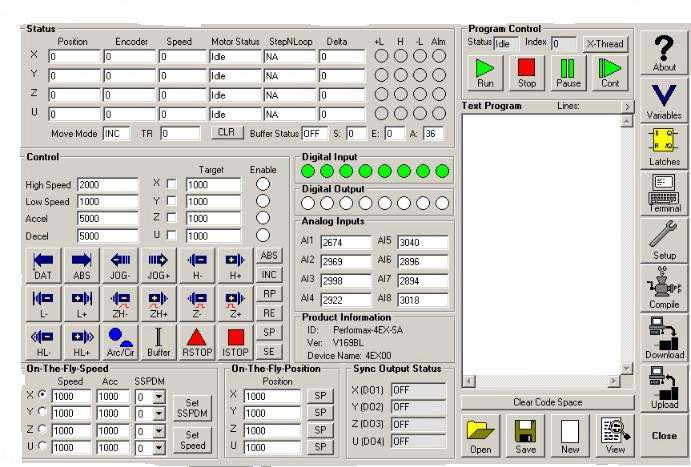 The main control screen is intuitive and divided into useful sections: viewing axis Status, Controlling each axis, viewing I/O, Variable editing, Setup configuration, and the Program editing sections allow full manipulation, creation and control of the application development. In the Program section is where we will write our application code. A “building block” or modular approach to program code development will be used. Often, engineers want to test a prototype design quickly and thus only need to make a simple point­-to­point move. This validates initial motor sizing, checks integrity of the actuation mechanism and provides a look into how it will affect the over­all system design capabilities. Using just a few, intuitive commands from the “SmartMotor” Standalone language, simple moves can be created and executed quickly. Now we can add I/O, in the form of limit switches for a homing routine and an output when the motion is complete to signal another process. Some conditional commands for flow control will also be introduced. Notice code in green is new/added while the red is code that has been changed. In summary, a simple ­one time ­absolute move was created with its parameters. From there we've added a homing routine which runs in relative mode and manipulated I/O to be able to “handshake” with other devices.